Lucie suffers from dissociative fugue. According to the Cleveland Clinic, “The word fugue comes from the Latin word for ‘flight.’ People with dissociative fugue temporarily lose their sense of personal identity and impulsively wander or travel away from their homes or places of work. They often become confused about who they are and might even create new identities . . . Dissociative fugue has been linked to severe stress, which might be the result of traumatic events—such as war, abuse, accidents, disasters or extreme violence—that the person has experienced or witnessed.” Discuss how the condition applies to Lucie. Lucie’s aunt Helen Ten Hands says, “We didn’t know how a mind could break so badly,” (p. 316). Discuss how and why neither Lucie nor her loved ones understood the depth of her mental illness. How might they have helped her earlier? Compare the pre-amnesiac Lucie with the “new” Lucie. How does she change, and what does this signify? How does Grady’s early family life affect his relationship with Lucie, and his own life choices? What role does his large, loquacious family play in the present-day story? Grady spends much time under water. Lucie woke in the water, and seems to be swimming through a fog. 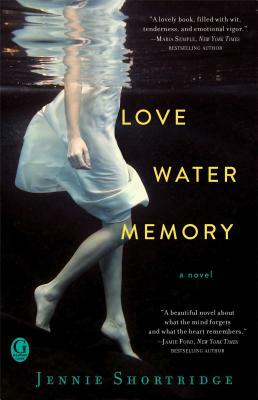 Discuss the symbolism of water for both characters in Love Water Memory. Lucie goes to great lengths to learn to cook after she comes home. What is the significance of food and the cooking scenes in the story? Discuss the role of psychotherapy in the book, and each character’s take on it. Why doesn’t Lucie get help earlier? Can family members force their loved ones to seek counseling? How did the death of a parent at a young age impact both Lucie and Grady? What are the similarities and differences in their experiences with love and loss, and how does early loss affect each one? Compare the effect of music for Lucie, and water for Grady. What do they each find in those things, and why? Helen longs to reconnect with her niece, yet is overwhelmed at having to tell Lucie the truth about the past. What contributes to her internal conflict? In what ways is Grady holding on to his prior notions of the “old” Lucie? How does this affect his developing feelings for the “new” Lucie? Discuss the similarities between Grady and Helen’s deceased husband, Edward Ten Hands, and what drew Lucie to each of them. How do you think Lucie will resolve her “new” and “old” selves?